Abercrombie: World's Worst Recession Brand? TIME just selected Abercrombie & Fitch as the "world's worst recession brand," reporting that Abercrombie has suffered double-digit same-store-sales declines for the past 10 months. We all know retail is hurting, but this isn't a category-wide problem. Compare Abercrombie's dismal performance with teen retailer Aéropostale, who saw second quarter profits rise by 83% as Abercrombie fell by 134%. TIME blames the decline of Abercrombie on the brand's unwillingness to cut prices and offer promotions, but they also report that the brand is no longer as fashionable as it used to be. 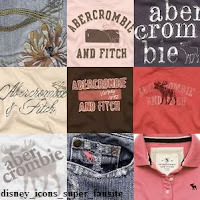 So is it time for Abercrombie to slash prices, introduce BOGOF promotions and shed its preppy, aspirational image? Or should they protect their positioning as a high-end apparel brand and focus on creating "funkier fashions." What would you do if you were brand manager for Abercrombie?